Seattle police detective Joanne Walker started the year out mostly dead, and she's ending it trying not to be consumed by evil. Literally. This is my first entry in the Walker Paper series and I have to say, I really enjoyed this book. I had no investment with Joanne’s character since I was coming into the middle of a series which is typically something I don’t do. But Murphy did a great job, bringing in details of previous books and characters as needed so that I understood each scene fully and intrigued me enough to want to pick up the previous books. 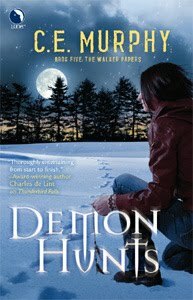 Demon Hunts is written in first person and while it was a little slow-going in the beginning, Joanne was able to pull me into her story. Murphy’s style of writing creates a clear voice for any reader to follow. However, at times, the pace of the story threw. In areas, where I expected fast paced action it dragged a little and some scenes seemed to take forever to end. But overall I enjoyed the book. Without giving away any spoilers, I will say that, Joanne’s reluctance to accept who and what she is, will reach a pivotal point in this book. Fans of this series will not be disappointed.